(poetsandquants.com) -- What does it take to be a great teacher of business? Pulitzer Prize-winning poet Mark Van Doren once mused that "the art of teaching is the art of assisting discovery." Poets and Quants' 40 top business school professors under the age of 40 all possess this particular artistic gift. They draw students into often esoteric subjects, inspire deeper thinking and engage discussion, assisting in the discovery of new and powerful ideas. 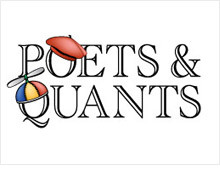 Poets and Quants searched near and far to uncover this remarkable group of men and women. Some of them have barely reached the age of 30, but they have made a name for themselves as rising stars in business academia. We asked B-school officials, students and alumni for favorites and then sorted through the nominations to come up with a list of the world's top 40 business profs under 40. Justine Lelchuk, a second-year MBA candidate at Harvard Business School and co-president of the HBS Student Association has an especially ambitious definition of a great teacher. "A master business school professor," she says, "is someone who is a dynamic facilitator, clear communicator, active listener, passionate expert, provocative motivator, bridge between theory and practice, and just plain human." That last attribute can be an elusive one for a professor who is deep in the weeds of an esoteric subject. But the absolute best professors can rise above their nerdiness. But like many achievers in just about any field, they tend to be inherently interesting -- often for the peculiar life choices they have made and their all-consuming passions. Alison Fragale, 35, a leadership professor at Kenan-Flagler, decided to go for her PhD in organizational behavior over moving to Vegas to become a casino dealer. Long before J.P. Eggers, 38, began teaching management at NYU's Stern School of Business, he performed as a fire-eater and a flying trapeze artist with a circus school. Make no mistake, these young business scholars are also bringing a tremendous impact to their fields. They bring to the classroom a wealth of knowledge from pre-academia work experience, consulting gigs, and their own academic research. Yale finance professor Heather Tookes has presented her findings to government regulators, including the Securities and Exchange Commission, while Lubos Pastor of Chicago's Booth School has earned such honors as the Nasdaq Award, the Goldman Sachs Asset Management Prize, and the Barclay's Global Investors Prize for his academic studies. While these rising stars are a diverse group, they share a common gift, if not pure love, for teaching. Almost all 40 have received awards for teaching excellence. They hail from all the core business disciplines -- finance, economics, marketing, management operations, strategy, and also social enterprise and entrepreneurship. They often take academic risks, pursuing passions within key subject areas instead of following the academic herd. And many of them are as intellectually engaging as they are entertaining. Consider Adam Grant, 29, a one-time magician who teaches leadership at The Wharton School, who engages students by using Apprentice-style challenges in class. "Performing as a magician taught me the value of surprises and well-crafted stories," says Grant. "I ask myself how I would want to be treated as a student." Derek Rucker, 33, a marketing professor at Northwestern University's Kellogg School of Management, has twice eaten 48-ounce steaks as part of Shula's steak challenge so he can convincingly talk about the advertising and marketing implications of the event. "I want my legacy as a professor to be my steady attempt to bring cases to life," says Rucker. "I do a Creepy Burger King Demonstration where I get a former student to dress up in a Burger King costume and secretly plant the person in the rear of the class." Tim Vogus, 36, a management professor at Vanderbilt's Owen School, has been known to bust a rhyme in class, rapping to the Beastie Boys, among others. He sometimes ambushes the class by transforming himself into a character from a case study, forcing his students to respond to the executive he plays. "It's a technique that gets students to manage difficult situations in the moment," he says. The master teacher always aims to leave an impression, make a mark. 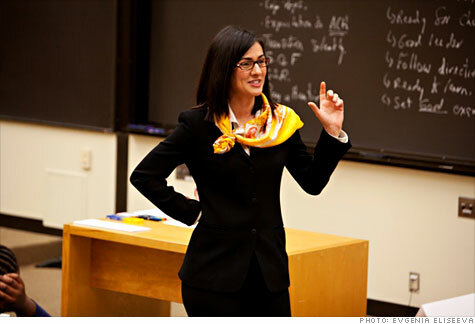 "Every time I walk into the classroom, I know that I am interacting with future leaders who will make a difference in the world and feel that this is my opportunity to contribute to something big," says Zeynep Ton, a 36-year-old operations professor at Harvard Business School. Students have described Ton, who won the award for teaching excellence from the graduating class of 2010, as that rare professor who can capture the attention of the class with enchanting lectures. Many of the 40 under 40 have taken career risks that could have backfired easily. When Mikolaj Jan Piskorski, now 37, first began to look into social networking at Stanford's Graduate School of Business in the early 2000s, his colleagues were skeptical. "The typical reaction to my work was 'you are crazy,'" he recalls. "'This is really funny. Teenage girls will really love it, but nobody else will take it seriously.' At the time, it was a big bet." Nearly 10 years later, his early research and his thoughtful and passionate teaching of the subject have made Piskorski a superstar professor at the Harvard Business School. As the resident expert at Harvard, Piskorski has written many of the definitive cases on social media for his highly popular Competing with Social Networks second-year course. Piskorski says he got his first glimpse of the impact a teacher can have as a high school student in the United Kingdom. In Poland, where he was born, there were 45 students to every teacher. In the U.K., there was a ratio of six students to every teacher. "It was just an amazing, eye-opening experience," he says. In fact, it ultimately convinced him that he wanted to spend the rest of his life teaching others. "I love to explain things to people," he says. The ultimate teacher's accolade comes from this unusual endorsement of Scott DeRue, 33, the baby-faced leadership professor at Michigan's Ross School of Business. "I hated his class," said one student in DeRue's Leading People and Organizations' course. "He forced me to think about things that made me feel uncomfortable. He made me look at myself in a light that I did not want to see. I needed this class..."